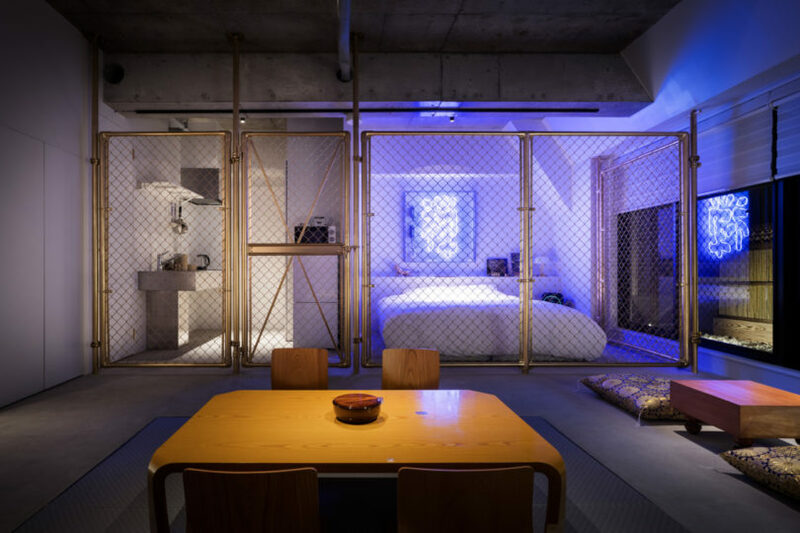 There’s another side to the serene, cherry blossom-filled nature scene in Tokyo and that’s the eclectic, sensory-overload district of Akihabara, where creative collective BnA STUDIO has just opened a new art-centric hotel with a vibe that matches the neon scenes from the streets. 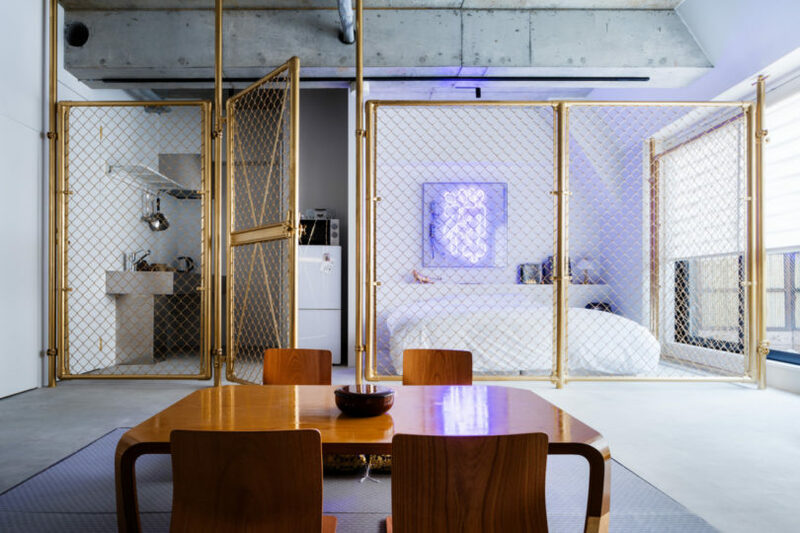 Following the opening of BnA STUDIO Koenji, the Akihabara location explores the Tokyo art scene and further more supports it by implementing a revenue share system that benefits the artists/designers that have played a role in designing the hotel. 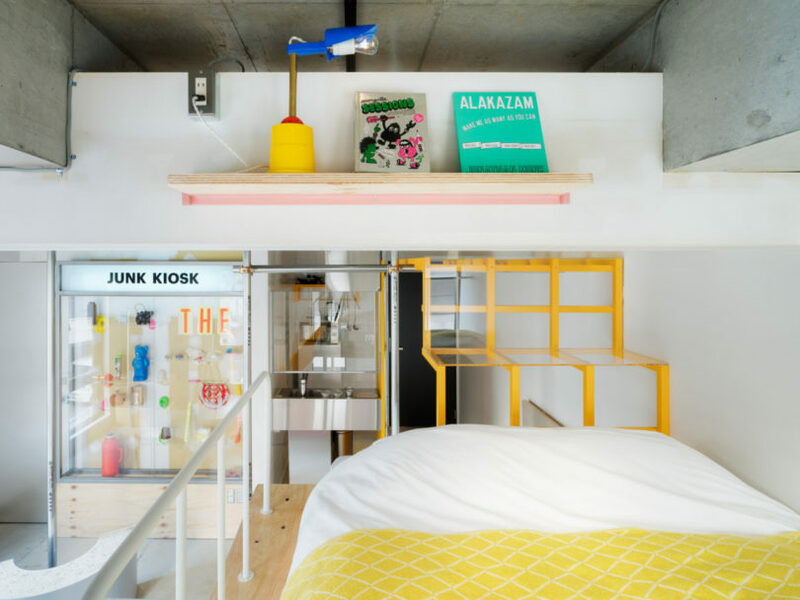 There are five livable art rooms, each designed by local Tokyo-based artists and designers. 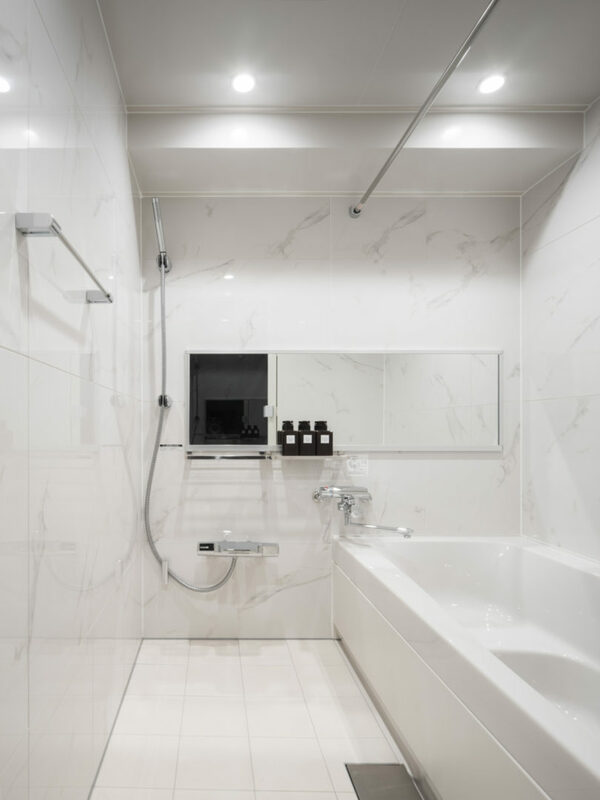 Each room comes with everything you might need for your stay: furnished kitchens, washer/dryer, high-end bathrooms, and Netflix (because why not?). 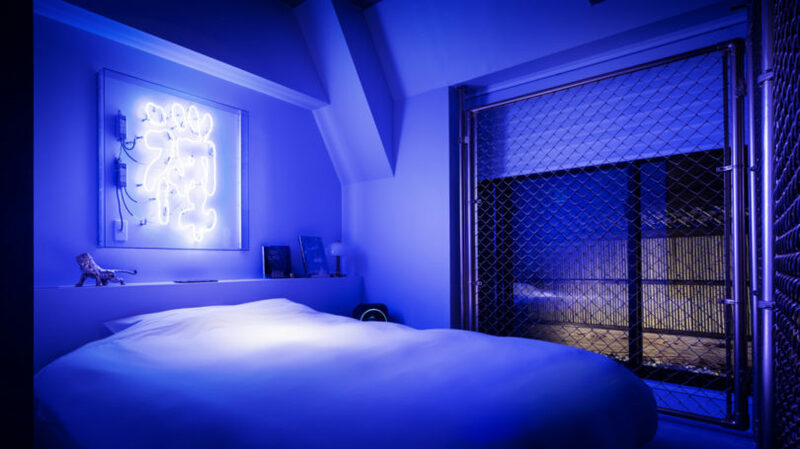 Each time a room is booked, a portion of the revenue goes to the artists that designed the room as a way to create a system that promotes exposure and continual income for the artist. 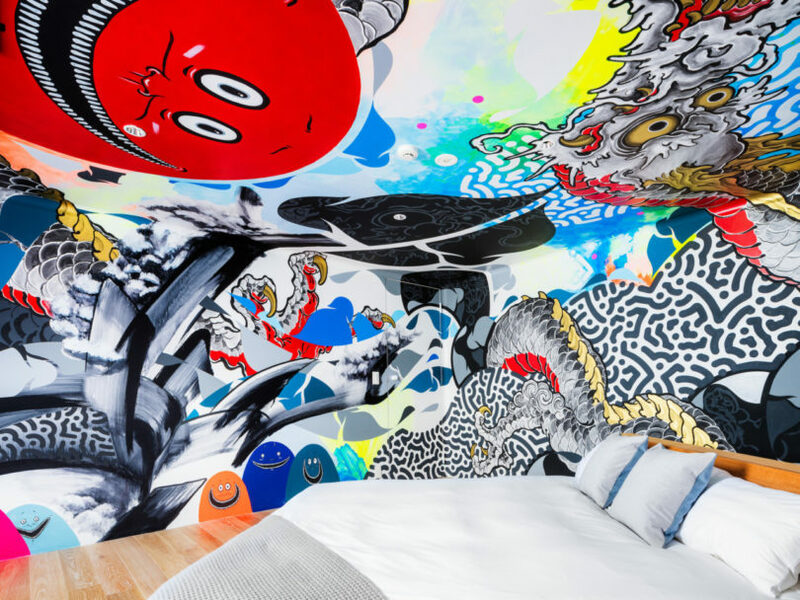 The RESPONDER room designed by 81 Bastards features a full 360-degree mural that pays homage to Japanese motifs (like dragons), street art, calligraphy strokes, and ukiyo-e paintings. 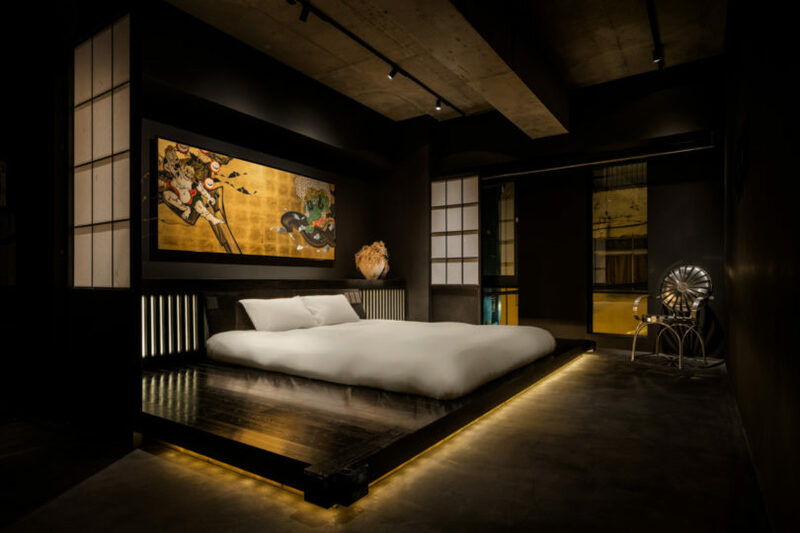 The room is both abstract and traditional. 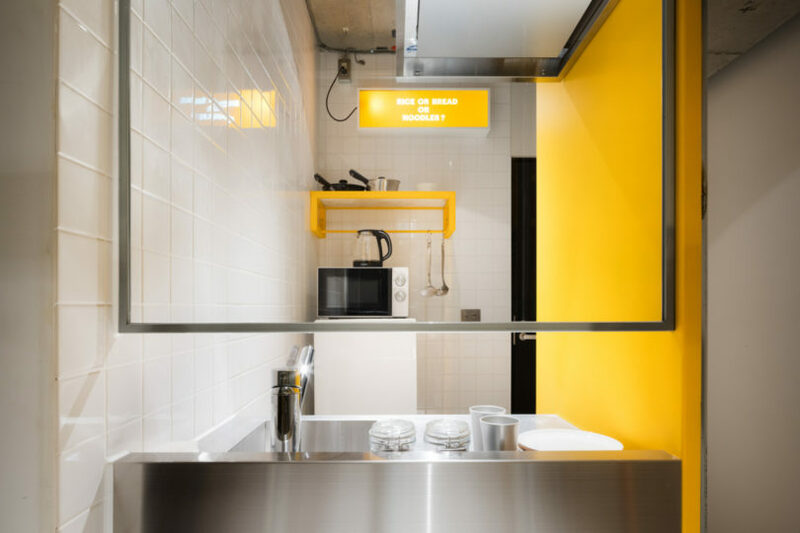 The HAILER room was also designed by 81 Bastards and, as a complete departure from the first room, incorporated street art in a more demure way. 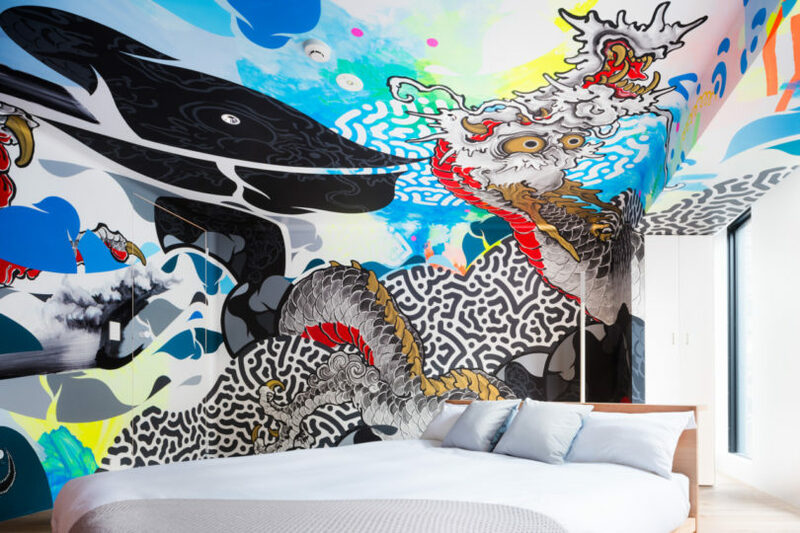 The collective updated one of Japan’s most recognizable artworks by Sotatsu Tawaraya’s “Wind God and Thunder God” with street art elements and personal styles. 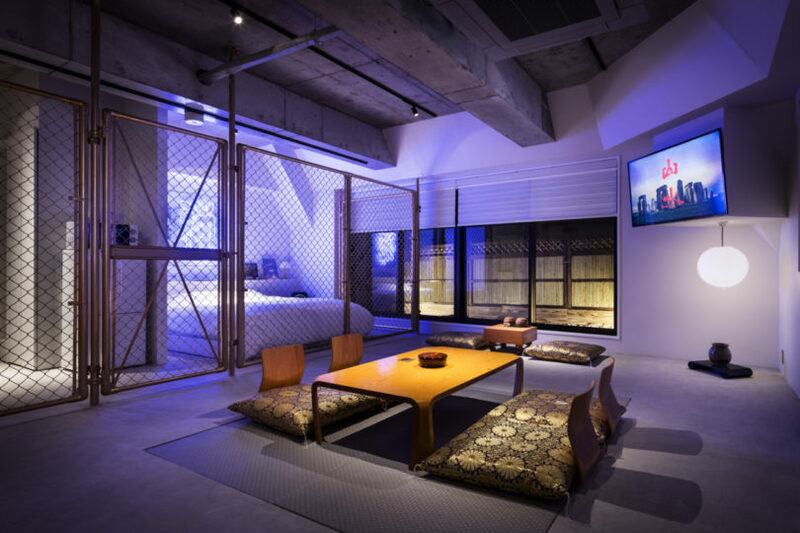 The ZEN GARDEN room produced by Taku Sato and 51.3 G-WAVE artists NANOOK, Kazuma Ogataand Mitsuko Shimae glows with purple hue as an exaggerated depiction of the juxtaposition of a “Zen Japan” in a modern metropolis city like Tokyo that’s bustling with chaotic energy. 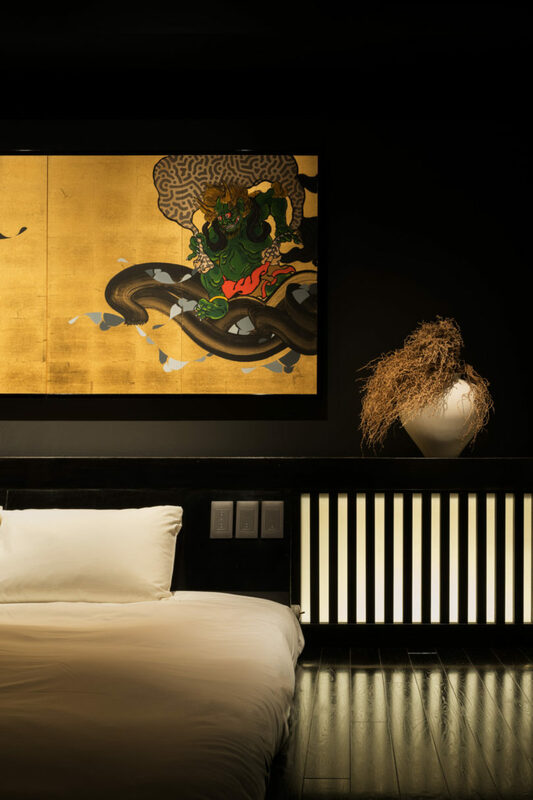 Traditional elements like low Japanese furniture and karesansui (a rock garden) keep the room feeling authentic. 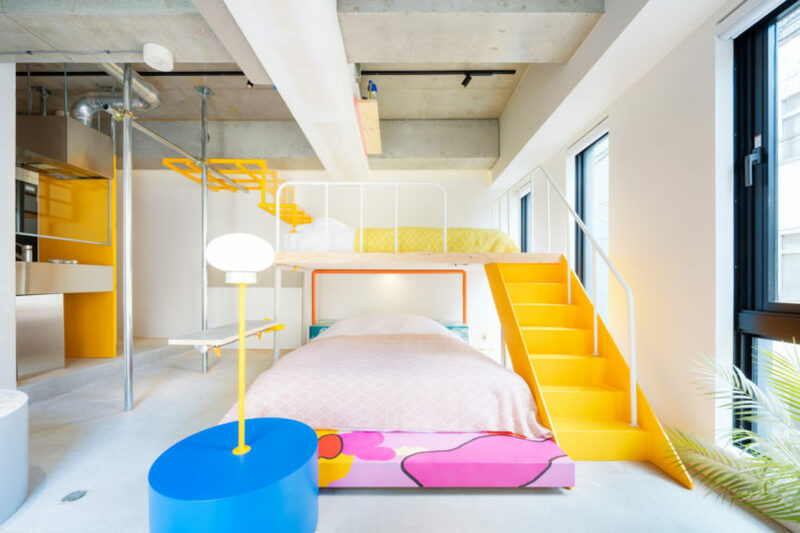 The WONDER PARK room produced by studioBOWL with design by Ryohei Murakami brings back high school memories of hanging out in the playgrounds and parks. 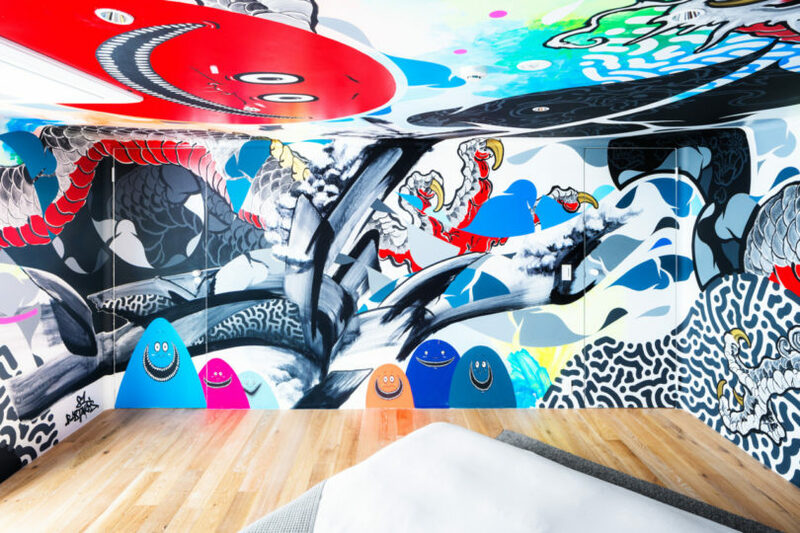 The room also explores the gap between industrial design and pop art. 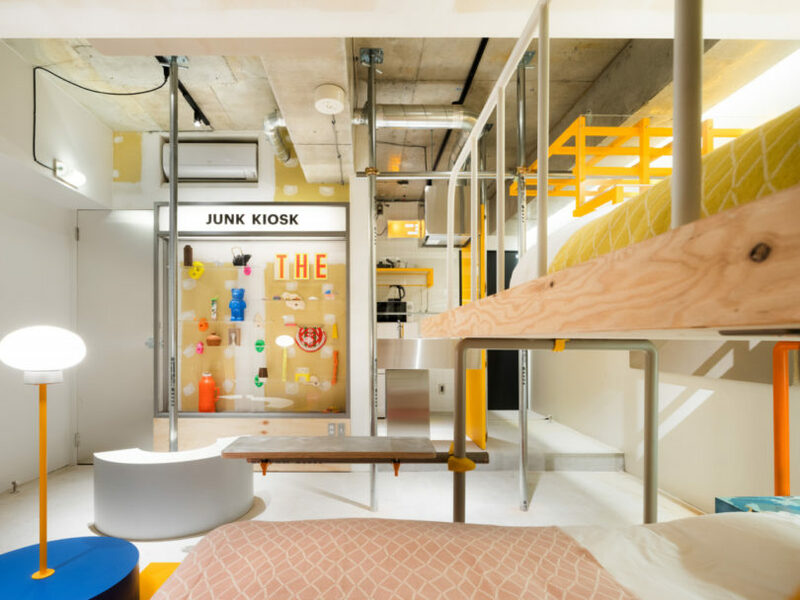 Last but not least, the ATHLETIC PARK room, also produced by studioBOWL with design by Ryohei Murakami, echoes the same childhood nostalgia with its jungle gym-like design. How much? 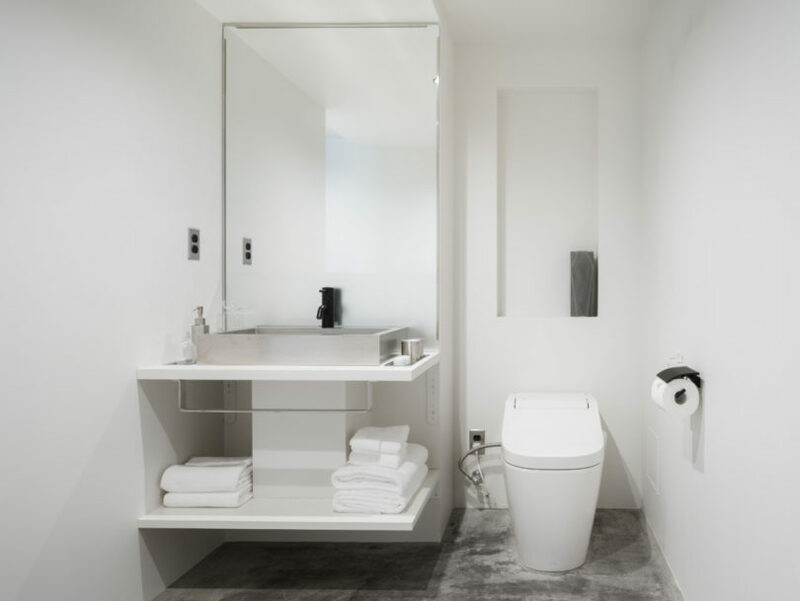 Rooms start at approximately $176 per night. 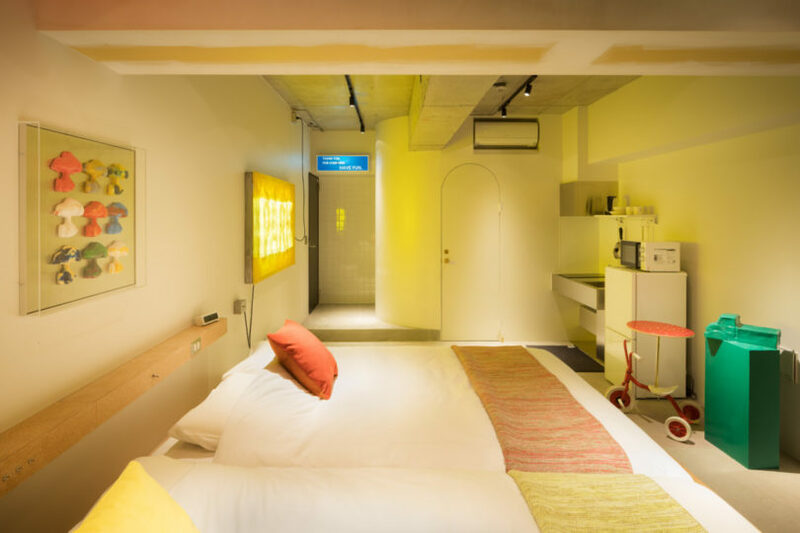 Highlights: This art-centric hotel echoes the same vibe as Akihabara itself: eclectic, bright, colorful. 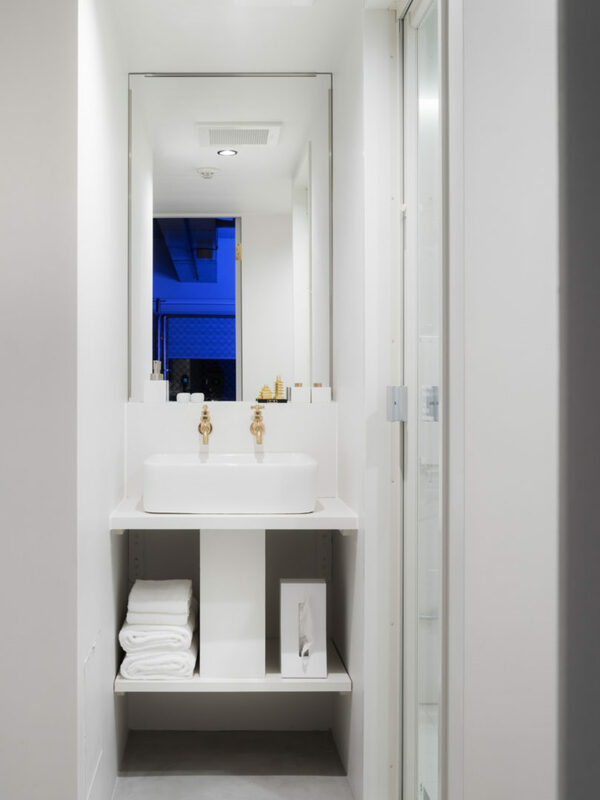 The hotel implements a revenue share system that benefits the artists/designers that have played a role in designing the hotel. 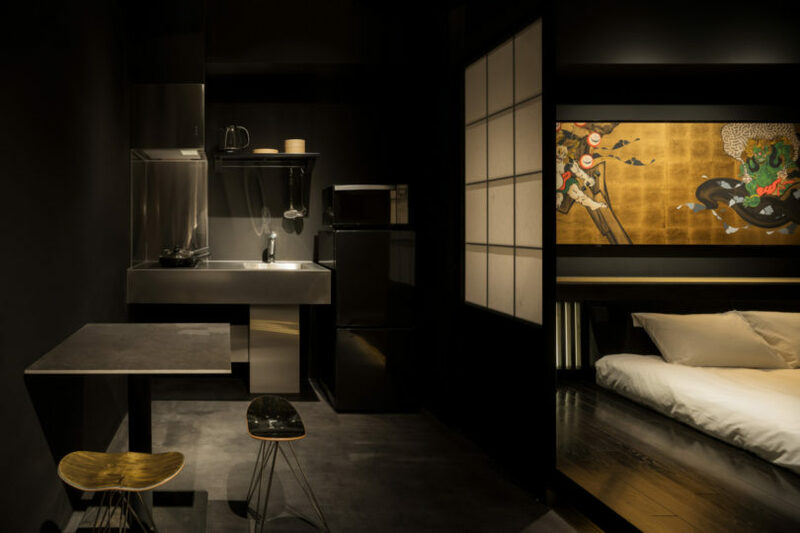 Design draw: The five rooms were designed by local Tokyo-based artists and designers who incorporated modern elements (like lighting and furniture) with traditional Japanese art and aesthetics.